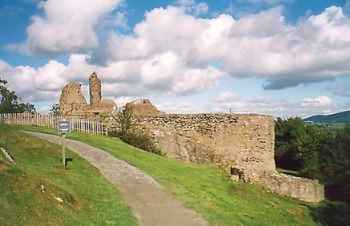 Montgomery Castle is an early 13th century stone enclosure fortress, founded by King Henry III. Standing on a rocky promontory, this successor to Hen Domen was given to Hubert de Burgh in 1228 and completed in 1235. The small strongly walled and towered northern inner ward is guarded by a rock-cut ditch and approached through the larger walled middle ward. Held by the Mortimers in the 14th century when it stood ruinous, in 1538-43 it was repaired and became a grand residence for Bishop Rowland Lee. Abandoned again in 1580, the Herbert family built a large brick house in the middle ward in 1622-5. Seized by Parliamentary troops in the Civil War, in 1649 the castle was comprehensively slighted by order of Parliament. Only foundations remain of the 17th century house and along the remainder of the ridge are the remnants of various outworks. 7 miles north is Powis Castle. Montgomery Castle is located above the town centre, off Arthur Street. 22 miles south-west of Shrewsbury, on the B4386. The site is owned by Cadw and is open daily 10:00-4:00pm.